When I first became a vegetarian, tabbouleh was one of the few dishes in my culinary repertoire. I recently updated this Middle Eastern staple—beloved for its pairing of fresh vibrant herbs with sweet, chewy bulgur. I’ve added a bit of lemon zest to brighten the flavor, and instead of soaking the bulgur in water, I soak it in veggie broth for an added layer of flavor. Tabbouleh is classic for a reason—it’s easy to make, tasty, frugal and healthy. What more could you ask for? In a medium bowl, soak the bulgur in broth for 30 minutes. Mix the remaining ingredients in a large bowl. 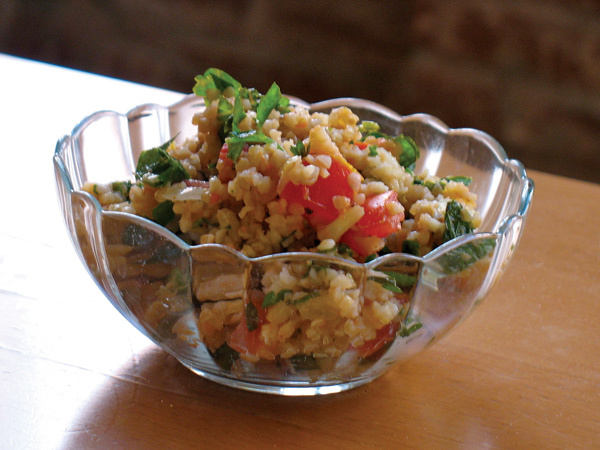 Stir the plumped bulgur into the ingredients in the large bowl. Chill or serve at room temperature.